See all of Sin City's top attractions on this 4-hour scooter tour. Travel through the Las Vegas Strip with a local guide, passing the Venetian, the Bellagio, the iconic Las Vegas sign and more. Check out the casinos and local fare downtown before heading to the Rio Hotel for panoramic views from the top floor. Hotel pickup and drop-off are included on this small-group excursion as well as all food tastings. This tour was extremely fun and entertaining from the start. The buggies were fun with to drive and ride around in. The two food stops were top notch. We also greatly enjoyed the fascinating tour stops. Another high point were our companions on the tour and our awesome guide Marion. Great tour! Amazing experience! We had the best time. Rode all over town stopped at Pawn Stars, Counting Cars and WelderUp. So fun riding down the strip in the Hog Cars. Great food at the Blind Pig and Rollin Smoke Barbeque. Thanks to our tour guides for a such a great time. This was by far the best tour we did while in Vegas. It was the best fun you could have and l would recommend it to anyone travelling to Vegas. We are still talking about it some 3 x months latter. This is the very best way to see Vegas. We had a great time, saw a lot--all the sights that we had expected and more, including much that was off the strip. Tom was very friendly and informative, and we had a wonderful day. I highly recommend. This is a great tour. Driving the scooters is so much fun and you get a lot of waves and laughs from the people on the street. The guide was informative and the places you stop are great. This was one of the best tours I have ever taken, it seemed like we were the attraction of the day that people were there to see. They were waving taking pictures and video, and wanting to know how they could do what we were doing. It was a blast. All the stops we made were fun and exciting. Tom our tour guide was very knowledgeable of the places we visited and enjoyed what he was doing it was that obvious. I would definitely recommend this tour to anyone going to Vegas. I will be telling all my friends visiting to take this tour for sure, I will probably take it again myself. Thanks Tom and Hog Car Tours for a great day. This tour is the ONLY way to see Vegas! The tour exceeded every expectation we had and was by far our favorite memory from the trip! 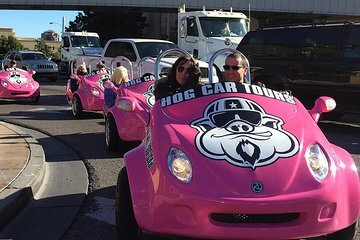 It includes food, cruisin' down the Vegas strip in a hog car, all the Vegas sites and a few hidden gems, plus a great tour guide. There's no reason NOT to do it! The price per car includes two people and two food stops plus all of your admission to tour stops. You can't go wrong! We were the only ones on the tour. Would have been more fun with other people, but not company's fault. Tom, our tour guide was very friendly, courteous, and informative. Had so much fun scooting around the strip. Unfortunately, it was very windy and could not go to the top of the Rio at the end. We stopped at an amazing Italian restaurant, The Blind Pig, for a sampler. It was so good. We also stopped at a gelato shop that had some of the best gelato we've ever tasted. We are not much into cars so the some of stop, though very interesing, just were not our cup of tea. For something different to do in Las Vegas, would recommend it. Tom was a great tour guide. Experience was fantastic. Seeing the sites from the scooters was great fun. Food stop was excellent. Enjoyed all stops and information that Tom provided. Never was rushed on the tour. All good for pictures.